The fried chicken looks as crispy as KFC’s. Yum! I like drums and thighs, and that’s about it. I would eat wings but I avoid breast meat if at all possible. hey! so surprised to see someone actually blog about nagaliar.. haha! i’m from miri myself. i used to eat this quite often last time until i became bored of it. =S LOL! 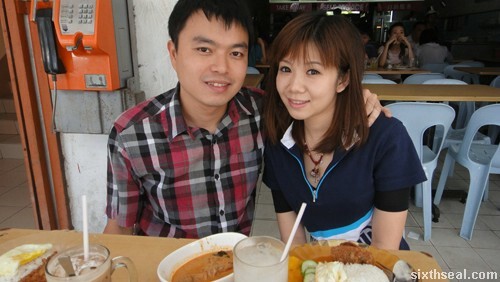 i prefer the curry chicken over the usual nasi lemak.. hehe..
Oh ya, I hear it’s quite popular in Miri. Personally, I’ve had much better (in KL) but it’s pretty good. 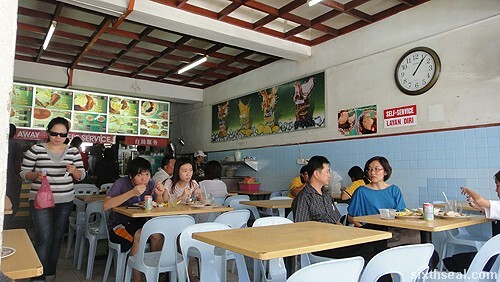 There’s this place in Sibu that serves pretty good nasi lemak too but it can’t compare to the authentic stuff over here. haha.. yeahhh!! i dislike breast meat so much! 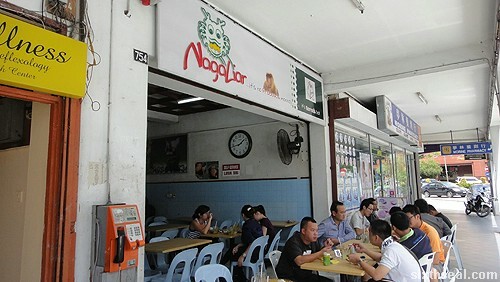 yes.. nagaliar is very popular in miri.. btw, did u try out the kolok mee at the night market? a few old men make their own noodles and sell.. it goes best with their steam chicken.. only can get at night.. it’s SOOOO GOOD!everytime i go back to miri, i must tapau back here to kl.. lol.. I shall check it out next time! 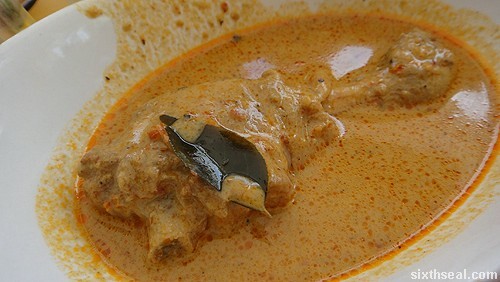 The curry chicken looks ok as I really prefer the spicy and Indian style of curry. I’m a big fan of spicy food – it makes everything appetizing. It looks so-so…but a bit expensive. Didn’t try the “wellness” centre next door? LOL!!! 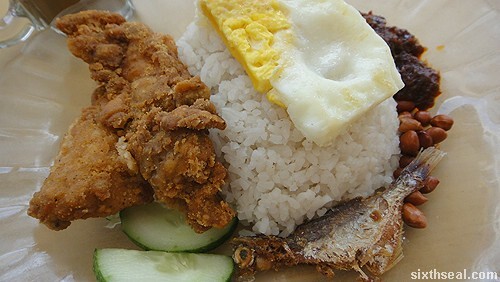 I thought it was quite cheap at RM 4 considering the nasi lemak I order here can cost upwards of RM 6 with chicken rendang drumsticks, two fried eggs, extra sambal siham, liver rendang etc. It has the works and it’s full of cholestrol. Heh! The van I go to at first though I was eating for two. I answer this question for HB. 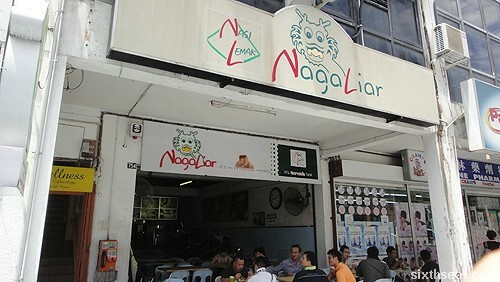 Naga Liar lah. Did you see the photos above? A duh duh. It’s Naga Liar as in “wild dragon” but I guess Naga Lair works too – “dragon’s lair”. 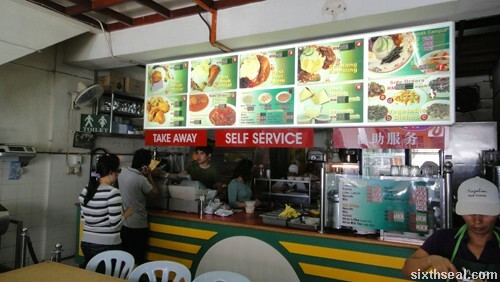 this used to be a staple for me back when i was staying in miri… it was sold in curtin cafeteria and heaps better than the rest of the food there AND i loved the fried chicken! for awhile i was hooked on this. however, i think the nasi lemak sold just below balcony is much better – you should give that a shot the next time you’re in miri. Oh, you mean the husband and wife team brought it to Curtin university to sell themselves? Or do they make it and leave it there e,g, an agreement with the Curtin administration? Yup the fried chicken is quite good eh! haha when i was in miri they were already a pretty successful business, and had the shop up and running already! i think they had an agreement with the lady running that particular stall in curtin – but if not mistaken it was discontinued after awhile, to my disappointment. don’t think the balcony nasi lemak can compare with some of the better kl ones, but the rice is rich and the sambal is pretty spicy, not too bad by miri standards i guess, and definitely better than nagaliar’s! I love spicy sambals! I bet I’ll love the one below Balcony better, unfortunately, I haven’t tried it. Even you don’t mention you went there around 1 pm, i will know too. Eh how come? You were there? 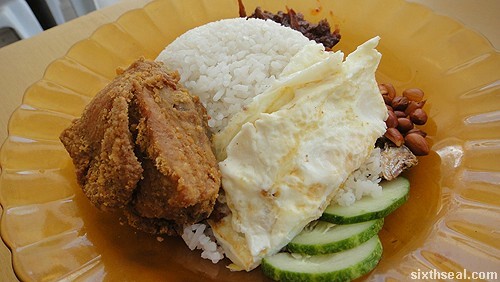 I think you can get better than that at the average road-side nasi lemak stall in KL, Village Park would blow it away! Yeah, I like the van that used to park outside Dataran Prima condo – I don’t know if they still operate over there. Now one of my favorites is the one that comes at 7 am in the morning in Pusat Bandar Damansara – also a van, unloads onto 3 tables on the sidewalk, great nasi lemak and good kueh too. They have this Jello type kueh which is kinda firm but jelly-like – it’s neon red and rolled in shaved coconut. Great stuff. $3 for a piece of chicken? wow, times have changed in M’sia. soon I can’t afford to buy kolo mee liaw. Yeah mate, that’s pretty much the standard price now. Hey, even kolo mee prices have gone up, much like kampua, there’s nothing under RM 2 anymore. I find Nagaliar’s nasi lemak to be simple yet, delicious! Though I don’t go there very often, it’s Miri’s most popular spot for nasi lemak, considering we don’t really have many of these kind of shops there. 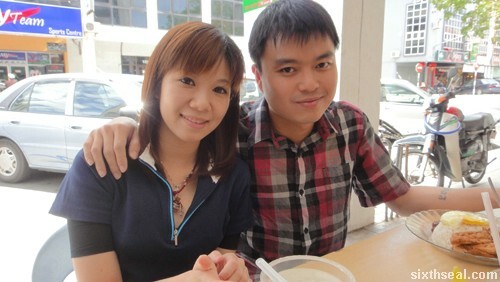 Miri is packed with chinese shops all around! Yeah, it seems to be very popular in Miri and I’ve heard a lot about it. Yup, Miri is a lot like Sibu in that regard, but I had nasi lalapan that’s really good over there too. There’s this chain of shops called Ayam Penyet over here, seems to be something similar but from different areas of Indonesia and slight variences. Btw, I’m quite bad when it comes to food especially in Miri. I don’t know much though I have been staying there for more than 10 years. Lol. Shall try the nasi lalapan when I get back. Heh! Yeah, I can understand that. New places crop up all the time and a lot of them go out of business after a short time, to be replaced by another and the cycle repeats. Not a lot of F&B outlets make it big, it’s a highly competitive industry. Yup, there’s a Kokoberry in Sibu too, it’s at Delta Mall. A friend of mine called Mary owns it.